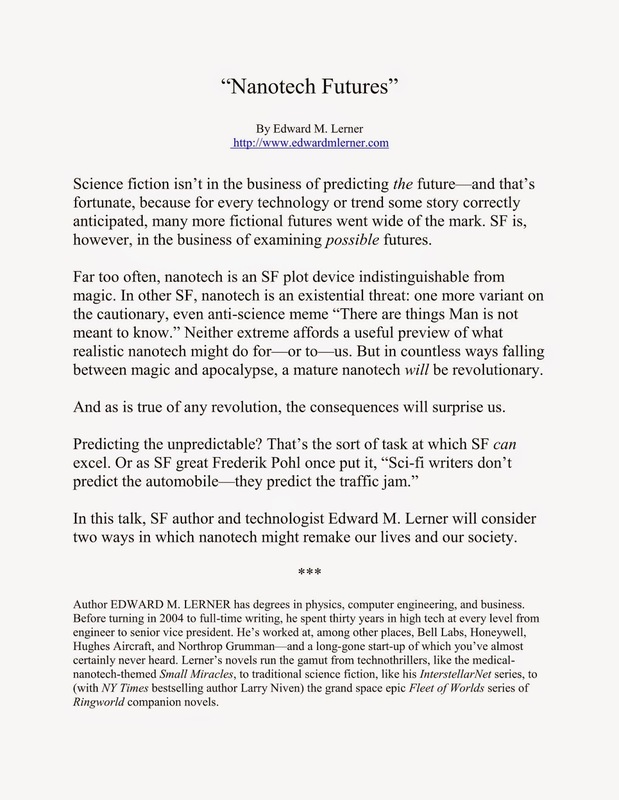 SF and Nonsense: Nanotech and starships and fusion, oh my! gave a talk at the National Institute of Standards and Technology (NIST), followed by a behind-the-scenes tour of many of their projects involved with nanotech. took part in a 100 Year Starship Symposium and, in the process, was a panelist for Science Fiction Stories Night. 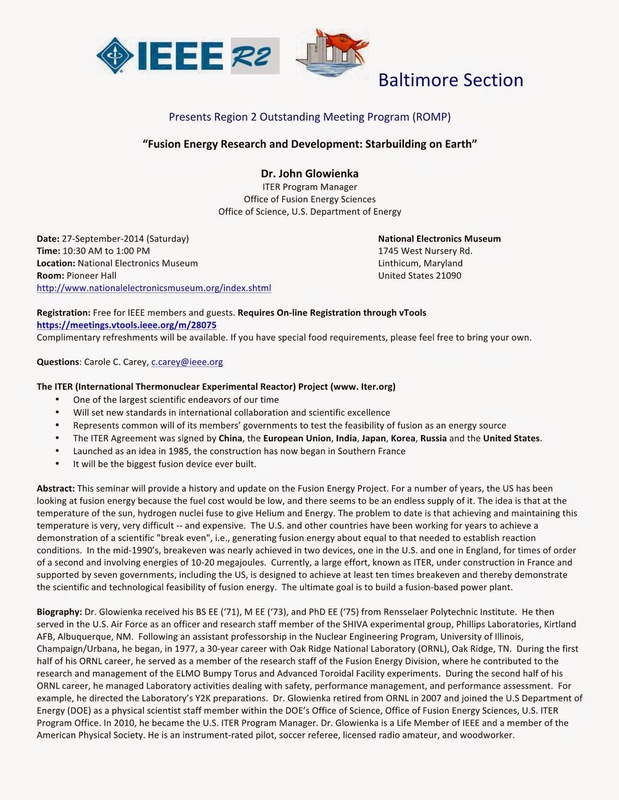 attended a lecture on the state of fusion energy research, cosponsored by the Department of Energy (DOE), the Institute of Electrical and Electronics Engineers (IEEE), and the National Electronics Museum. A mantra taught in business school is, "If you can't measure it, you can't manage it." That adage applies equally to the practice of engineering. And when the technology at issue is nanoscale, like the nearby graphic of a single walled carbon nanotube (the vertex of each hexagon is a single carbon atom!) to measure things isn't easy. But NIST is on the case. Why was I there? In part, doing research for a new novel (for now, I'll offer no other hints about that project). And to give a talk about what nanotech might portend a few decades out. One of the possible futures about which I speculated was an expanded version of last June's post The neural interface you always wanted is (at least, could be) coming. And the second? That'll be my secret until the new novel happens. For your own glimpse at this exciting work, check out NIST's nanotech portal. The recently completed annual symposium offered some of, well, everything a space-travel enthusiast could want. Speculative presentations, to be sure, about far-out propulsion methods and energy-storage systems of vast capacity. Insights into the state of SETI. The challenges of building closed-loop environmental systems robust and adaptable enough to sustain a crew for years -- if not decades or generations. Space elevators. Governance of future extra-solar colonies. Communications with extra-solar colonies. The social, cultural, and educational challenges of creating and maintaining broad, general interest in such a bold, long-term project. And much, much more, from an event membership well leavened with academics, industry scientists, and the occasional astronaut. And I call this work? And me? Well, before my authorial gig, I worked in aerospace and high tech for thirty years, including a stint as a NASA contractor. When I write SF, I do my best to get the science and tech right. This symposium was an audience that appreciated that -- with many a participant citing SFnal examples or relating how SF had inspired them personally to get involved with science and tech. Bringing us to Science Fiction Stories Night (see nearby poster). The International Thermonuclear Experimental Reactor (ITER) is, simply, one of the largest -- and potentially, most revolutionary -- scientific undertakings of our time. (In that way, ITER is like the Large Hadron Collider, about which I blogged a few weeks ago, as The romance of physics). It sure would be nice to have clean, limitless energy. Alas, it seems that commercial-scale fusion power generation won't come about -- even if all goes well -- for several decades. Regarding Fusion, I assume you've seen the latest announcement from Lockheed? Thanks for checking. As it happens, I *have* seen the announcement (fast on the heels of my post, of course). I'm reserving judgment till LockMart's fusion reactor is more than a press release. I'll be delighted if a breakthrough IS at hand.